I am SO excited for todays post, everyone. I have been blogging for almost three whole years, and have yet to run a giveaway. Which is why I am so excited to be teaming up with my Beauty Bloggers of Central Florida gals and Reviva Labs to bring you guys this exciting giveaway! A lot of my friends (both blogging + real life) use Reviva Labs and are huge fans of the line. They have a small amount of products available at Ulta, but I believe that the bulk of their products are available on their website. 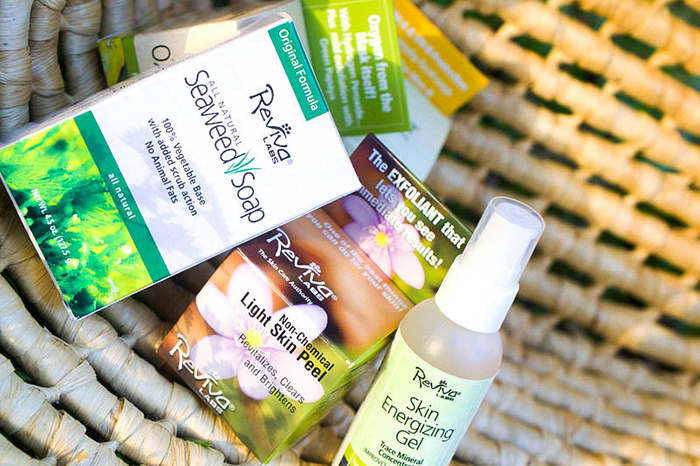 I am dying to try their All-Natural Seaweed Soap, which is meant to discharge toxins and stimulate circulation. I'm also really intrigued by their Hawaiian Seaweed Facial Cleansing Milk, which is meant to energize skin and lift out dirt, makeup, and environmental debris. What I think is the greatest thing about Reviva Labs is how affordable their products are. Nothing is too unattainable! Okay, you guys. It is time to enter. Get to it! And a special thanks to Reviva Labs for sponsoring this awesome giveaway! What are some Reviva Labs products that you've tried or are thinking about trying? Disclosure: This giveaway is sponsored by Reviva Labs, and is in collaboration with the Beauty Bloggers of Central Florida blogging group.